Country Club Greens Apartment Homes, totaling 68 units, closed yesterday for $6,025,000 ($88,603/unit). The building was fully occupied at close of escrow. Christopher Roach, Matthew Roach, and Joseph Dietz of ORION Investment Real Estate negotiated the off market transaction. “The buyers are a father and son team out of Vancouver, Canada. They plan to hold the property for long-term cash flow, while making gradual improvements to the unit interiors. They were attracted to the property based on the fundamentals of the rental market, ideal property characteristics, and excellent roadside visibility. The Seller had purchased the property from the bank, and stabilized the asset to full occupancy with improved operating income. All parties involved made this a very smooth transaction, and a win-win for both buyer and seller,” noted Christopher, Vice President at ORION. 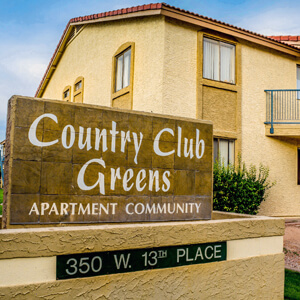 Built in 1985, Country Club Greens is individually metered for electricity with a unit mix of mostly two bedroom/two bath units. The units offer gourmet kitchens and other amenities, including full size washer and dryer, mirrored closets, and extra storage. The community has excellent roadside visibility on State Route 87 and amenities, including immediate access to Loop 101 and 202 Freeways, swimming pool and spa, and assigned covered parking.